Cloud Computing is an approach to sharing computer resources over the internet, complying the principle of pay-as-you-go. Cloud computing services provide compute, storage and database services which enable your organization to quickly provision the IT resources it needs without significant capital investment. The Cloud computing services provides the features like highly durable storage services, low latency databases and a suite of application development tools which will only pay for as you're using them. Before the advent of Cloud computing, Client/server computing prevailed, the paradigm in which the entire data and applications were centralized. Connection with the server is the first step followed by data access in the client/server paradigm. This was followed by the paradigm called Distributed computing, in which all the computers are networked together for resource sharing on-demand. Neither of these two paradigms could suffice the emerging need of internet and data requirements. In the year 1961, John McCharty brought up the idea of selling computing as a service. However, it took almost four decades for this idea to materialize completely. In 1999, salesforce.com has started delivering applications to the enterprises over the internet, which was later molded and termed as the Cloud Computing. The concept of Cloud computing is to provide a platform that allows the enterprises to pay based upon the usage of the resources rather than payment based upon the quantity of the resources. This approach allows enterprises to use the resources, only upon demand and optimize the expenses for computing resources. In simple words to say, the computing resources are tailored to the usage. What is the need of a Cloud Computing Service in business? There are different reasons why a business needs Cloud computing services. Cost reduction - As the resources are utilized only on demand, cost-cutting can be achieved. Ease of access - Devices can be connected to cloud irrespective of their geographical location. Scalability - Scalability with cloud computing is just a plug-and-play mechanism. Scale as you need. No backup needed - The data in cloud servers is maintained without flaws and can be accessed round the clock; therefore no backup of data is needed. Data security - Data in cloud servers is stored with sophisticated encryption mechanism, which makes almost impossible for data breach. On-demand self service: An on-demand service refers to the service that can be obtained, only when there is a need and self service refers to the fact that the cloud services can be obtained through a simple online control panel provided by the cloud computing service provider. Broad network access: Broad network access refers to the capability of Cloud computing to be accessed from a wide range of devices, irrespective of their geographical location, provided an internet connection. Resource pooling: Resource pooling refers to the capability of a service to be served to multiple isolated entities in the cloud environment simultaneously. Rapid elasticity: Rapid elasticity refers to the ability of cloud servers to be extended or to be abbreviated in times of heavy requirement. Measured service: Measured service refers to the services offered by the cloud computing service provider in order to estimate the cost of resource usage and other purposes. No infrastructure or application investment - As infrastructure, platform and applications are available in the form of services, no investment is needed for them. Minimized management cost and efforts - As management of the infrastructure and applications is taken care by the cloud computing service providers, management efforts can be minimized, so are the efforts for it. Reliability - As the cloud servers are maintained under sophisticated environment, they are highly reliable. Data security - Cloud computing can provide utmost data security to their customers. Automatic software updates - Software updates can be delivered with ease using cloud computing. Required high bandwidth internet connection. Costly approach for small scale organizations. Client-Server model: In the client-server model, a server serves the requests of a client, where the requests are initiated by the client. This is the most common paradigm of data access across the internet. Grid computing model: In Grid computing, the resources of a computer are shared with other computers available in the network, where the computers are heterogeneous in nature. This is a distributed approach of resource sharing. Cloud sandbox model: Cloud sandbox is a testing environment that allows testing of pieces of code using Cloud services in an isolated environment so that the entire code database is not disturbed upon a software fault. Peer-to-peer model: A Peer-to-peer model is a distributed resource and application sharing method, in which each entity of the network is called a peer. Torrents are the best examples that involve in peer-to-peer model. Mainframe computing model: In Mainframe computing model, the computers are very powerful. These are used for critical applications that involve in bulk data processing. These are expensive in nature are used if and only if there is no other go. Fog computing: Fog computing is another paradigm in which the edge devices of a network like switches, routers, bridges and other network access devices as resources of computing. It is usually said that the best way to protect your data and privacy is to stay offline and cloud is not an exception. But in case of cloud services, private cloud services are more secure and private when compared to that of public cloud services. However, there is a tradeoff with the cost. Opting for private cloud services results in increased expenses. The implementation of cloud computing services varies from vendor to vendor. Though every vendor provides an option of migrating to another vendor, it takes high efforts for the migration. This situation is technically called Vendor Lock-in, where migration from one vendor to another is available but a complex process. In the process of sharing resources among the inherent capability of affecting resources of another system is called Isolation failure. This is a byproduct of resource sharing for cloud computing. Care is to be take by the Cloud Computing Service Providers, in order to minimize the effect of isolation failure to the least possible. In Cloud computing, the architecture is usually divided into two types - Front end and Back end. The client computer and the application required to obtain the cloud computing services are together called the Front end of cloud computing. The user interface of the applications that facilitate in accessing varies from application to application. The infrastructure that processes the inputs for computing is usually called the Back end of cloud computing. This infrastructure includes different types of computers, servers and other data storage systems. Cloud computing can be used for any kind of use case, where each use case is allocated with a dedicated server. Hypervisor is a technique that allows users to install and run multiple operating systems on single hardware simultaneously. A Hypervisor application divides the available hardware resources virtually among the different operating systems available, usually called Virtual Machines (VMs). It allows each of these operating systems to be run as a mere process in the host operating system. A Hypervisor application eliminates the need of extra hardware resources required to operate an individual computer system. Cloud management software refers to a suite of tools and technologies that provides a platform to manage the cloud services they provide to the customers. Usually, the services provided by the Cloud Computing Service Providers include data storage, cost optimization, backup and recovery, performance monitoring, security, control and compliance, analytics, resource utilization and other minor cloud services. Google Cloud Platform, Scalr, Kubernetes, Apache CloudStack and DivvyCloud are the popular cloud management software. The process of enabling the end user to obtain the cloud solutions after performing the necessary application installation and configuration is called Cloud services deployment and the software that enables a vendor to achieve such state of services is called Deployment software. AppVeyor, AWS CodeDeploy, AWS Fargate, Bamboo and CircleCI are the popular deployment software available. Network plays the key role in the cloud computing infrastructure. For all the services a vendor provides, network is the base. From the cloud computing service provider point of view, configuring the network and the protocols allows the provider to deliver network as a utility. Server is the heart of cloud computing. A server takes care of the services like resource management, monitoring the resources, privacy and security management etc. Storage is another key component of cloud services. A vendor should provide the service of being able to access the data across a wide range of devices, irrespective of their geographical location. The cloud service in which the services to the customers are provided with the help of dedicated private infrastructure is called Private cloud. The Private clouds are also called Enterprise cloud. HPE, Dell EMC, Microsoft Openstack, Red Hat, VMWare and IBM are the popular private cloud computing service providers. The cloud service in which the services to the customers are provided with the help of shared infrastructure is called Public cloud. In this paradigm, same infrastructure can be utilized to provide services to multiple customers. The expenses with the Public clouds are less when compared to that of Private or Enterprise cloud services. Amazon Web Services (AWS), Google Cloud Platform and Microsoft Azure are the popular public cloud computing service providers. 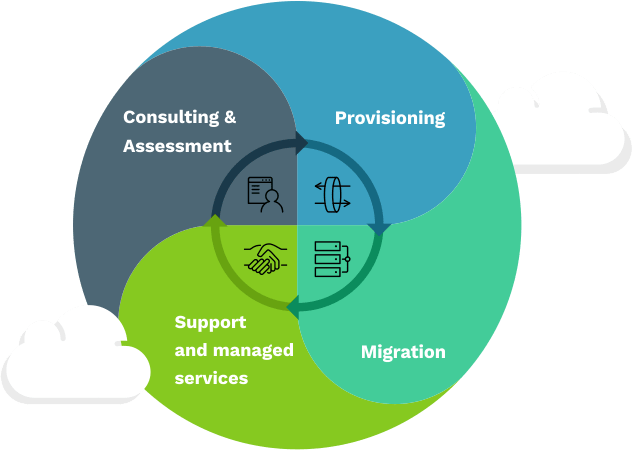 The cloud service in which the services to the customers are provided either with the help of dedicated infrastructure or shared infrastructure is called Hybrid cloud. The Private and Public cloud computing service providers can together provide hybrid services to the customers. In this approach, an organization outsources their infrastructure requirements from a cloud computing service provider. Enables easy dynamic scaling of infrastructure. Variable cost pricing model can be easily achieved in IaaS. Easy delivery of infrastructure on demand. Dynamic allocation of resources is easy. Helps in eliminating the investment in redundant hardware. Infrastructure overhead is usually maintained by Cloud Computing Service Providers. With public cloud, IaaS does not guarantee data security. Availability of internet decides the quality of service. Limited user privacy and customization. In this approach, the platform required for software development is provided as a service i.e., PaaS allows the customers to eliminate the need of underlying infrastructure. Enables the developers to execute the code conforming to the policies. The underlying infrastructure is abstracted to the end-user. It enables the process of deployment to be automated. Automatic updates - PaaS supports automatic updates. Decreased cost - Reduces the expenses that accumulate to the infrastructure. Compatibility - Compatibility between software and hardware is high. Easy collaboration - Teams from different locations can collaborate easily. Lock-in - Certain resources may be locked-in, which may affect the performance. Limited scalability - Scalability of PaaS is limited in comparison with SaaS. In this approach, enterprise wide area network services are provided to the customers virtually, based on the subscription. The subscription can be obtained either for individual services like optimization, security etc or for collective services. Bandwidth on demand, Mobile network virtualization and Virtual Private network are the three service models of NaaS. Minimizes capital investment along with staff time commitment. Implements a network with predefined and guaranteed up time of the network. SD-WAN helps in eliminating the traffic for the applications like VoIP. IDaaS is mainly used for authentication services, which are usually managed by third party cloud computing service providers. The Cloud Computing Service Providers of IDaaS provides their authentication services using Single Sign-On (SSO). Identity Governance and Administration (IGA) - The ability to reset the password. Reporting any unauthorized access attempts. In this approach, software is provided as a service i.e., SaaS allows the users to access applications over the internet, as a service. Provides network-based access and management of the software. Application management can be done from a remote location. Updates can be provided to all the systems on-the-go. Cost saving - Eliminates the cost of installing and configuring applications. Scalability - Applications installed can be in large number of computers easily. Accessibility - An internet connection alone can open a way for numerous applications. Security - Absolute security cannot be provided as third-party applications involve. Outages - Downtime of cloud servers results in service outages. The MBaaS provides a platform for the mobile app developers in linking the backend of a mobile application, in addition to the features like social networking connectivity, push notifications and user management options. Software Development Kits (SDKs) and Application Programming Interfaces (APIs) are the two ways in which MBaaS provides backend for mobile apps. MBaaS is also called Backend as a Service (BaaS). Robust implementation of backend services. Capability to support high performance hosting. Overhead reduction and improving efficiency in mobile app development. Less resources and more efficiency - Enables mobile application development in limited resources. Speed of development - With MBaaS, mobile applications can be developed quickly. Developer experience - Helps in enhancing developer learning experience. Limited control - Backend control over the mobile app and the hosted code is limited. FaaS allows users to manage application development with limited infrastructure. FaaS is the paradigm in which there is no need of servers i.e., serverless services. The main implementation of FaaS is found when developing microservices applications. Modularity and isolated function execution. Speeds up the software development process. Decreased transparency towards the customers. Difficult to keep track of functions, when there are many functions. AWS is the cloud computing platform owned by the e-commerce giant Amazon. It provides cloud computing resource to various entities like corporate organization, government, individuals etc. In 2017, Amazon has started wide range of cloud services, including IoT and Amazon Elastic Compute Cloud. Kamatera is one of the world’s leading Cloud services vendor. The data centers for Kamatera are located across the globe for providing a better service to the users and corporate organizations. The capability of setting up a server under a minute is what distinguishes it from other cloud computer service providers. Microsoft Azure is the cloud computing service owned by Microsoft itself. It proves SaaS, IaaS and PaaS services to their customers. The advantage of Microsoft Azure over other cloud computing service providers is that it wide range of programming languages and frameworks that are absolutely useful for the growth of an organization. The search engine giant Google has also invested in cloud computing services, where Google Cloud Platform is the outcome. When compared to other cloud computing service providers, Google can provide its cloud services at lesser prices as Google uses its internal infrastructure to provide these cloud services to the customers. Rackspace Cloud is an America-based cloud computing service provider. PaaS is the major service provided by Rackspace. It also ventures into other areas like cloud storage, web application hosting and virtual private cloud servers. IBM Cloud is the cloud computing service provided by IBM. SaaS, IaaS and PaaS are the cloud computing services provided by IBM Cloud. In addition, it provides public, private and hybrid cloud platforms also. The business applications like Customer Relationship Management (CRM) and Enterprise Resource Planning (ERP) are implemented with the help of cloud computing. Cloud office suites help in accessing required business document over a browser. Such cloud services in business eliminate the need of installing respective applications. For example, you’re using an Android mobile Google Drive helps you store and have a backup of your documents. Another Google app Google Photos help you save all your photos and images for backup. Similar kind of data storage and backup apps were also developed by other Cloud Computing Service Providers like Microsoft. Management applications help you visualize the performance of an application in real-time. It helps in understanding the consumption of resources for any given application. Management application along with cloud computing has several applications in many aspects. Apart from these sectors, cloud computing is very useful in many other sectors like entertainment, photography, art etc. For example, there are mobile applications like Prisma that help in image processing using cloud services. Following is the gist of cloud computing in simple words. For example, whether you’re working in retail real estate with financial data or photos your business depends upon the applications that run reliably and securely at a cost that scales with you needs. Cloud computing services are accessed via the internet to help you build and run those applications. Capacity planning becomes easier too in a traditional data center launching a new application can be a bit of a gamble. Provision too many services you could end up wasting money and at the same time time provision too few and your customers might not have the best experience. With the ability to add and remove capacity elastically the application can scale up to meet the customers needs and scale back down again quickly saving you money. It is often heard from customers that the biggest performance improvement come from that own team's ability to deliver innovative new features to market more quickly. With Cloud computing services, development teams are able to focus on adding differentiated value for their own customers rather than on the heavy lifting of racking and stacking service. This helps drive innovation by making new ideas feasible that were once out of reach. Experimentation is fast and low risk making it possible to track new projects which would once have been constrained by costs or resources. Successful experiments can go into production quickly and you won't have to live with the collateral damage or cost of those that didn't pan out. In today's interconnected world it's possible for any company to end users across the world from on multiple geographic regions. The Cloud computing servers help businesses survey customers globally without the need for expensive time consuming physical geographic expansion. A few clicks you'll be up and running. Codigion provides wide range of cloud computing services. We offer different services with public, private and hybrid cloud computing services. We are the cloud computing service providers, who provide unmatching services as IaaS, PaaS, SaaS, MBaaS, FaaS, NaaS and IDaaS. Our expert team for providing cloud computing services are well experienced and have extensive real-time experience. As one of the leading cloud computing service providers in India, we have collaborated with various internet service providers in order to deliver the best state-of-the-art and most efficient services to the customers. Though there are various cloud computing service providers across the world, we have have customer from different geographical locations across the globe, who are our recurring clients. We provide hosting services at very affordable prices and efficient maintenance for our services. And that’s one of the reasons for our recurring global clients. As do what we speak and as a cloud computing service provider, we offer a self-service to the customers through a customized, interactive and responsive web interface. This helps you manage the cloud services we provide even without reaching us for any support from us. However, support will be provided as needed. The same mantra of cloud computing service provider - Pay as you use. We strictly follow this and we assure you that every penny is you pay us really pays you out. Our customers are of our primary and high priority preference. Scalability is one of the characteristics of every cloud computing service provider. But what we differ from other cloud computing service providers is that our security and support. We offer the best possible security for our customer with non-disclosure agreement, when the customer is obtaining public cloud computing services for us and as mentioned, support will be provided at every point of time you need.